Dedicated to AD'A, Petter Sammerud, Bruno Vivoli, Carlo Steinhauslin, Hedera Cjuraru, Carolyn Carpenter, Jeffrey Begeal, M. Moleiro, and countless others who have all been builders of this library, participants in its dream. n Monasticism we make Vows to God of Poverty, Chastity and Obedience. Benedict teaches in his Rule that monks and nuns should balance Work, Study and Prayer in our lives. These are ideal ingredients in the recipe for running a library. I had been Librarian in my Anglican convent at Holmhurst St Mary in Sussex at a time when the Diocesan Archdeacon was rounding up books and depositing them with us. A Sister Madeleine of the Order of St Elizabeth of Hungary had just died and he brought me to her convent, consisting of library, guest house and chapel in Heathfield, to bring away their books. 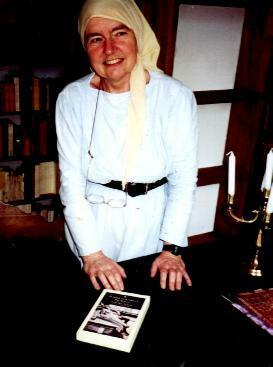 Though I had never met her I fell in love with this Sister Madeleine. She had hit upon the idea of opening her dwindling convent as a library to the town of Heathfield which previously had none. Books had consequently poured in as gifts. Among them I found her own books where she had been teaching herself Hebrew, and her notes on retreats she had given herself, on the Shekinah. But when I asked others about her they only remembered her as the Retreat House's large cook. 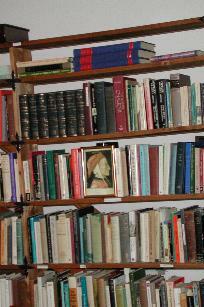 I had felt her books should have stayed in situ, her library continuing in Heathfield. I decided, nevertheless, she and her library were ideal models for ours. Then after four years I had to flee my library and my convent, coming to one unheated room, too book-filled to be sorted, and on foot in broken leaking shoes, for four years, while carrying out the edition of Julian of Norwich. What had sustained me was the group of ecumenical readers that had begun in my convent library: a Catholic woman theologian studying at King's College; a Jewish woman theologian studying at King's College; and all of Hastings Quaker Meeting. They had asked me to give a series of lectures on the medieval Friends of God. One day we realized we could call ourselves 'Godfriends', putting God in first place in our lives, as in this phrase, and there are thus no boundaries between us. Our Jewish member helped teach us Hebrew. We continued in contact while I was a hermit above Florence, my one luxury the computer and the web. After a further four years the Swiss Evangelical Church found me, because I had earlier edited Elizabeth Barrett Browning, and gave me this Gatehouse in Florence in exchange for looking after the 'English Cemetery', which they own. I agreed - if I could run an international and ecumenical library in the Gatehouse. They said 'Yes'. The library and cemetery are in a Florentine piazzale, Piazzale Donatello, around which, in the nineteenth century, were built huge studios, at a time when they believed Florence would again be the art capital of the world. I named our library and workshop after Fioretta Mazzei, a Florentine whom I met in the last years of her life, at the Mass for the Poor she had inherited from the former mayor of Florence, Giorgio La Pira. She had initiated the United Nations' Rights of the Child at the Ospedale degli Innocenti, she had also initiated the Amicizia Ebraico-Cristiana in Florence, and she had tirelessly worked among the poor, she and Giorgio La Pira bringing all the world's mayors to Florence's Palazzo Vecchio to sign the 'Declaration of Peace'. In her small booklet, Blue-Green Thoughts, she speaks out against pretentious book-learning and for the learning of skills. This is much more important than reading a book. As one enters this door to the Library one steps back in time, a time of hand-crafting and of caring. For this space is also time. 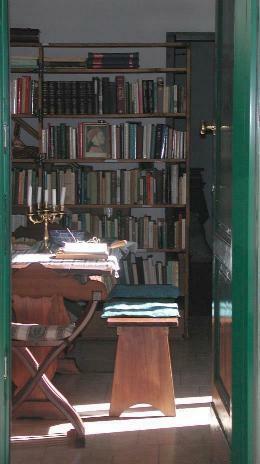 Our library is in a large room, our workshop in the room next to it, the printing room upstairs. The workshop's great table, sawn from the cemetery's cypresses, was once the laying out table on which the bodies of Elizabeth Barrett Browning, Walter Savage Landor, Arthur Hugh Clough, Fanny Holman Hunt, Fanny and Theodosia Trollope, Maria Boecklin, have lain. It is just the right height to work at standing, binding, for instance, their books. Below it is a shelf at near floor level on which are placed great sheets of our marbled and of Florentine printed papers that we use in book binding. In this workshop, I make the shelves for the library, bind its books, frame pictures, while students repair there the marble of the tombs in our 'English Cemetery'. Sometimes, outdoors in the cemetery, we marble paper, drying the brilliant sheets amongst the tombs, then use these in our book binding. I have inherited a sewing frame and book-binding press from my convent and use these to create books which we then sell to fund the library, such as Julian of Norwich's Showing of Love from the Westminster Manuscript, in English, in Italian, set in William Morris' Troy Font. I was also been given by my Sisters an old and priceless album of nineteenth-century sepia photographs of Florence, that they had almost placed on a bonfire, bringing these back from Sussex to Florence. Our bookshelves, made from wood planking, take their design from those in the Bodleian Library, where my father had worked as a child and where I have read medieval illuminated manuscripts. 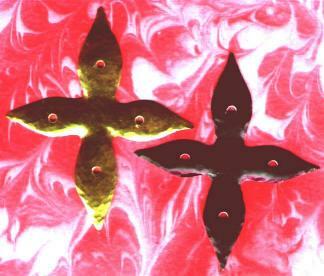 Their lilied crosses in iron that strengthen and conceal the wood joins and corners are handwrought by craftsmen in Settignano, Florence and Volterra. 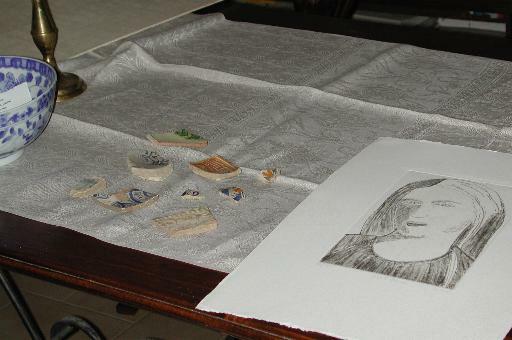 I cover the sides with Florentine papers of Benozzo Gozzoli's frescoes of the Council of Florence to which the Patriarch of Constantinople came, briefly reconciling Orthodoxy with Catholicism. I wrote an essay on my sorrow at modern museums' divorce from the past, their minimized and cheapening style, asking that we learn to return to creating their 'otherness', in particular what was useful and beautiful about it. I have seen too many monastic libraries be changed from wood to metal and plastic, yanking the books from their context. We keep this library's computers, with which we create virtual libraries on the web and on CD, in the office the other side of the arch. We want our library as a place in time past, preserved to teach time future, as an heirloom, a heritage, a treasure hoard. When I had first come here everything was dirty. The modern and filthy plastic and metal window shades I banished, putting up wooden dowels with blue-green damask curtains on wooden rings, instead. The metal shelves likewise are exiled to the workroom, used now for the tomb restorers' chemicals and tools, behind green curtains, on which exhibitions can be hung. I hope to banish as well the large and ugly modern staircase and replace it with a graceful Victorian circular one, which will allow more shelf space for books, and more room for slide lectures. Ladders are also needed for reaching the upper shelves. Along the tops of the shelves I yearn for seventeenth through nineteenth century style busts, copying the originals, of our authors buried here - like those in the lost Cotton Library, like those in Trinity College Library. Upstairs is the printing press we bought by 'nickle and dimeing' friends and acquaintances for an engraver, Bruno Vivoli, out of work and despairing and angry at the Mass for the Poor, who, when I asked him what 'arte', what skill, he had, told me he had studied engraving as a schoolboy in Florence. His work is beautiful and mostly about Florence, Dante reading the Commedia to Florence, or the Giotto Madonna that was at the Badia until Vasari threw her out, and we sell his engravings to visitors to the cemetery, giving him all the proceeds. A favourite is 'Maternità', a mother and child. Bruno said when he first showed it to me that this is what is wrong today, too much selfishness, that we need more mothering, more nurturing. A Norwegian artist came and helped with this project and printed these engravings at a school before we had acquired the press. He, too, agreed that we needed to return to the gentleness of mothers and children. Usually he painted black paintings about despair. Instead, in Florence, he copied the Badia Madonna, with glorious gold leaf surrounding the tenderness of the Child. Which Bruno then copied in turn as a fine engraving. Men showing Maternity. In Catholicism we women cannot be ordained priests, though we can be eucharistic ministers. Another ministry yet is Sister Madeleine's, of running a library, open to all, ecumenical, international, with no boundaries or barriers. A generosity of nurturing. A sanctuary of stillness. Perhaps why successful libraries are women's places open to men. There are so many in such need. I only rarely can afford to buy a book, a used one from a barrow in the streets of Florence, or one off the web. But nevertheless books pour into this library, sometimes gifts of entire van loads of books. Often books beyond my wildest dreams, like the facsimile edition of the St Petersburg manuscript of Brunetto Latino's Li Livres dou Tresor, published by M. Moleiro in Barcelona, Spain, or the gift to me of the Laurentian Library Brunetto Latino Tesoretto facsimile, because I had transcribed and edited its text. I think this generosity is because people sense it is a library that belongs to all. A Scotsman who went to America, working in steel in Pittsburgh, said it was a sin to die rich and gave libraries to all the American towns, the Carnegie Libraries. My youngest son used run a free canteen in the streets of Washington, D.C., New York and Philadelphia, called 'Everybody's Kitchen'. Similarly, this is 'Everybody's Library'. It belongs to you, its readers, out there on the web, and here in Florence. This information is also entered into the computer and placed on the web as our 'Recent Acquisitions Catalogue', so we can search to find if the membership is current and so others can find out books and come here to read them. We hope soon to have the entire collection catalogued and web-accessible. Books are much preferred to money, as more direct, simple and tangible. Books are records, memories, of people, from the past for the future, like the tombs in this cemetery. In our library, they are recorded memories not only of their authors, but also of their donors. We especially encourage the donation of books by and about the people buried here. Just arrived is a first edition of Isa Blagden's Poems, as petite as was she, which we took out to her tomb, both with flowery garlands on them. Elizabeth Barrett Browning set Aurora Leigh in Isa Blagden's Bellosguardo villa. Before that, three volumes were given us by two separate people on the life and art of Hiram Powers, the Native American sculptor friend of Elizabeth Barrett Browning, also buried here following the burial of three of his children. So we are not only a library, but a museum, and with the computer, one that is both real and virtual, that is intensely interactive with the public, in this city and globally. About the past's wisdom and beauty, for the future. We organize the international and ecumenical library with its first shelves on the alphabet and the Bible in its original languages, followed by the Church Fathers, then sections on Judaism and Islam. After that we have sections on the monastic orders, especially concentrating on women contemplatives' writings, followed by a section on hermits. Next comes pilgrimage, followed by the Middle Ages in general. Followed by a complete collection of the Greek and Latin Classics, most of which were preserved in medieval monastic libraries, but which became paramount over the Bible only in the Renaissance. A section on Italian literature follows, then French, German, Spanish, Portuguese, and Russian literatures. A section is on dictionaries, encyclopedias and grammars. Another section on Fioretta Mazzei. Icelandic, Irish, Welsh and English literatures follow, first medieval, then Renaissance, finally Victorian and twentieth century literature. A bay is filled with my publications on Brunetto Latino, Dante Alighieri, Geoffrey Chaucer, William Langland, Birgitta of Sweden, Julian of Norwich, and Elizabeth Barrett Browning. 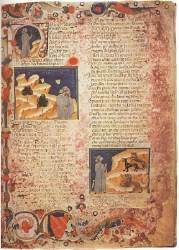 Then comes Art History, Codicology and Paleography, Manuscript Illuminatio, Arts and Handcrafts, guidebooks to Florence. Finally, the children's shelf, with tiny Hebrew Psalters, and a mat on the floor for their reading. They can look at the great books with medieval manuscript illuminations. Heloise said to Abelard that scholars and cradles don't mix. We contradict her with a wooden hand-painted Rom rocking cradle that we have made, which takes pride of place in our library, and which we use to undo prejudice and to teach about better ways of child raising that we have learned from them. 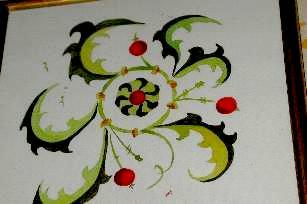 Painted on it is the design I copied from the fresco of the Cardinal Bessarion's house in Rome. He was instrumental in the temporary reconciliation between Orthodoxy and Catholicism, and a great scholar of Greek, his manuscripts brought to Italy beginning the Renaissance. We placed the specifications for making these cradles on the Web at http://www.umilta.net/cradle.html and every day these are read and used. 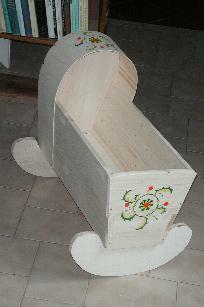 Five other cradles we have made in our workshop, our bottega, are now is use in Italian and Rom families, in Florence and in Romania, while this one is here, usually filled with cloth diapers, again to teach about raising a baby less expensively and more lovingly (€100 instead of €2000 for the two years of diapering, for which a Rom mother has to beg and whine in the streets), while protecting the environment for that baby when becoming adult and parent in turn. After all, the earliest, most rare, printed books are called incunables, from being from the 'cradle' of printing. 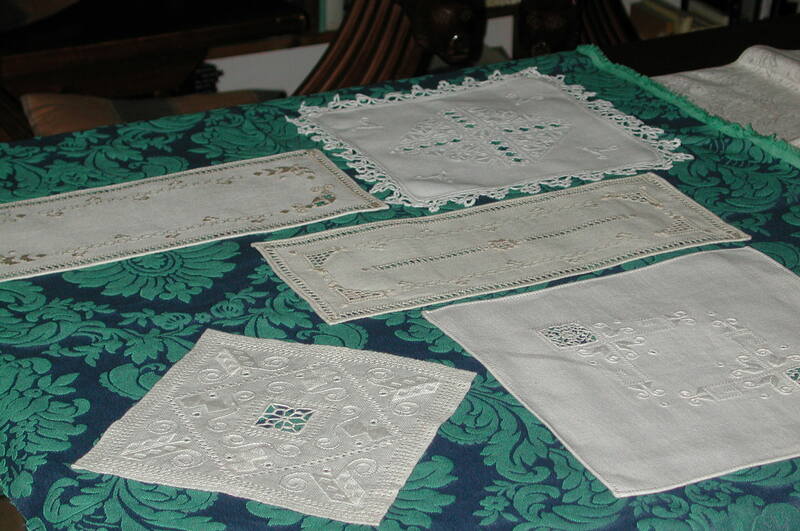 In our care about crafts we network with punto antico embroiderers in the Mugello and photographed their work on our library table for a web essay, promising to make contact for them with embroiderers in Romania so they may learn each others' stitches. We care about hand-loomed cloth from Farfa Sabina, with its design of the Shekinah, two peacocks flanking a chalice, and use this on our library table. 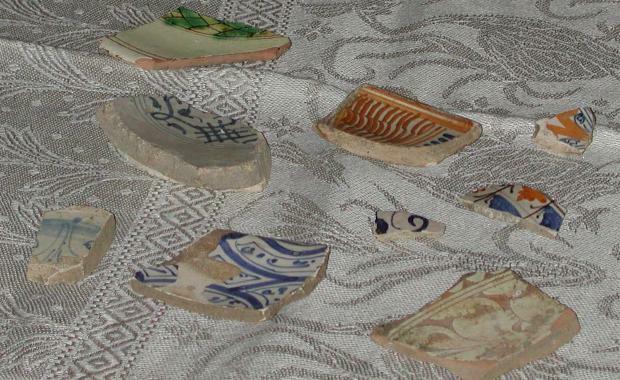 We find fragments of hand-painted medieval pottery in the cemetery and bring these, too, into the library to study and encourage potters to replicate today. Our library is open to all. An Arab, living in the street, once read the Bible in it for hours upon hours. We have a fine parallel text Koran. A gypsy mother has copied the alphabet and the Lord's Prayer here, while learning to write and read. Many Italian students come as they work on theses on Elizabeth Barrett Browning. So do English Open University students, and scholars from America, Holland and Russia, these to work on Julian of Norwich, Birgitta of Sweden, Alfonso el Sabio and Brunetto Latino. For we have two networks, one, the Mass for the Poor, from Florence's Badia, where Boccaccio used to lecture on Dante, the other the World Wide Web, or 'voo, voo, voo', as the Italians call it, not having the letter 'W' in their alphabet. From these two networks come our Dante reading group of Florentines and foreigners on Thursday evenings followed by Vespers and supper, all by candlelight in our library. When we had finished all of the Commedia and also the Vita Nuova, the group had said to read them all again, as Dante says to do in his last line. We organize the international congresses in Florence on 'The City and the Book', the first on the alphabet and the Bible, the second on medieval illuminated manuscripts in Tuscan libraries, while the third City and Book congress will be on this Swiss-owned 'English Cemetery' and those foreigners buried here who contributed greatly to Florence in Italy's nineteenth-century Risorgimento, publishing their Proceedings on the Web in both Italian and English. For we argue that cemeteries with tombs are like libraries with books, again messages from the past to the future, written on marble rather than parchment. At each congress we hold a Book Fair in our cemetery, advertising these books on our websites, and thus receive further donations for our library of needed and useful books. The structuring of these congresses now undergirds a grant proposal to the European Union in collaboration with libraries in Ireland, Iceland, England and Poland. 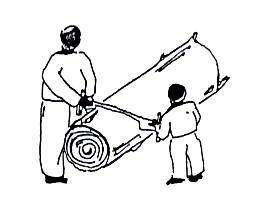 Ask your child to give you a hand. 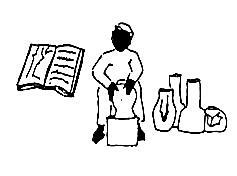 Ideally, we should each have a skill, like Peter's fishing, Paul's tent-making, Jesus' carpentry, and at the same time be rabbinical scholars as they were, and so live the Gospel. Good skills for a librarian are the writing of books and the carpentering of shelves. All of which can be done in one's retirement with one's pension.